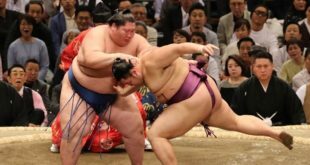 Hakuho a surmonté les efforts déterminés de son adversaire Myogiryu (2-3) pour rester invaincu. 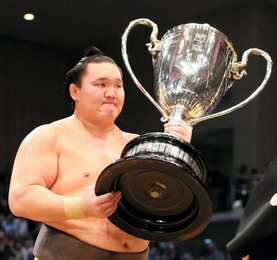 Le yokozuna a fait preuve de force et de volonté pour continuer sa route vers un potentiel 42e titre. L’ôzeki Goeido, les maegashira Ichinojo et Kotoshogiku sont également invaincus. Goeido a ravi son public avec une victoire dynamique contre Shodai. L’ôzeki a chargé avec une épaule solide pour ensuite pousser rapidement Shodai. Onosho (3-2) a à peine inquiété l’imposant Ichinojo, qui l’a rapidement jeté au sol après la première collision. Après une série de victoires décisives, l’ancien ôzeki Kotoshogiku a tourné autour de Ikioi (1-4) et l’a forcé à sortir par derrière. 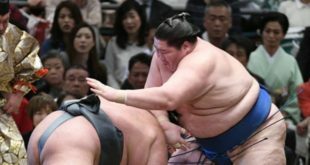 Kakuryu a amélioré son score à 4-1 avec une victoire facile contre Daieisho. 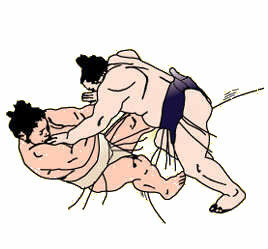 Dans un duel de komusubi, Hokutofuji a vaincu Mitakeumi. 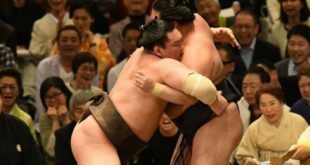 Après un choc violent, les deux hommes se sont disputés, mais c’est Hokutofuji qui a trouvé une ouverture pour conduire Mitakeumi (3-2) hors du dohyo. 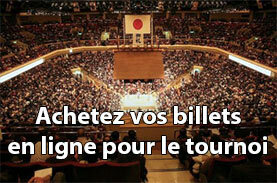 Tamawashi, qui cherche à obtenir une promotion comme ôzeki, a vaincu Takakeisho. Les deux hommes échangèrent une série de gifles avant que Tamawashi (2-3) ne force Takakeisho à sortir son pied du cercle. L’ôzeki Takayasu a obtenu sa quatrième victoire en battant Nishikigi (0-5) avec une sortie frontale tel un bulldozer. Le géorgien Tochinoshin a remporté sa troisième victoire en battant le Brésilien Kaisei (0-5). 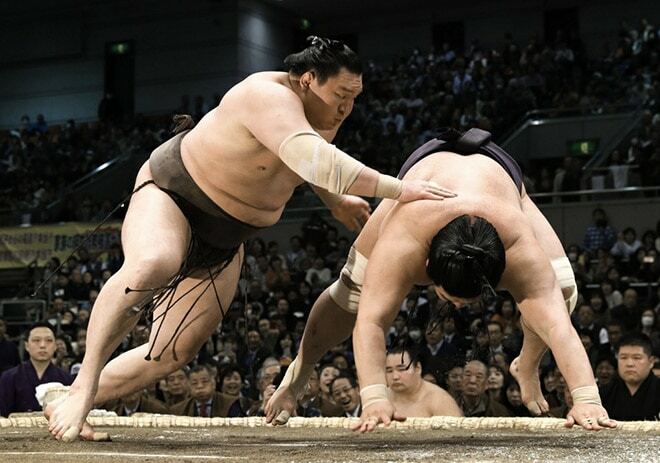 Yokozuna Hakuho overcame a determined effort by rank-and-file opponent Myogiryu to stay unbeaten Thursday at the Spring Grand Sumo Tournament. In the final bout of Day 5 at Edion Arena Osaka, the grand champion showed strength and willpower to maintain his pursuit of a record-extending 42nd top-level title. 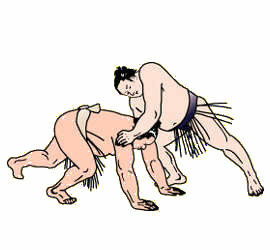 The Mongolian superstar led with his right forearm, pushing and slapping Myogiryu to the edge. But the No. 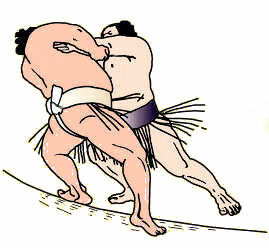 2 maegashira stood his ground, attempting to topple Hakuho with his arm on the inside. 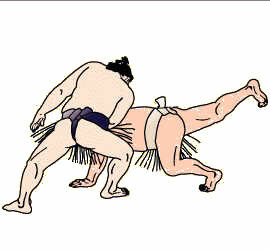 The two became separated before a fierce exchange of blows that ended with Hakuho thrusting Myogiryu (2-3) to the clay. 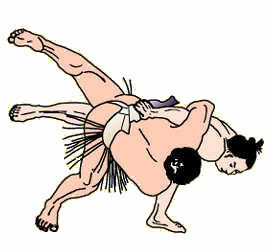 Also remaining unbeaten at the 15-day tournament is ozeki Goeido, No.4 maegashira Ichinojo and No. 8 Kotoshogiku. Local favorite Goeido delighted his home crowd with a dynamic push-down win over No. 3 Shodai. 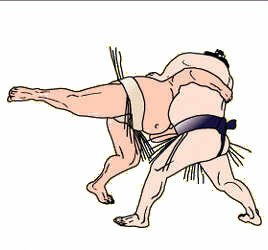 The ozeki, a native of Osaka’s Neyagawa city, followed his customary hard shoulder charge with a quick shove that sent the winless Shodai tumbling over the straw. Towering Mongolian Ichinojo was barely troubled by No. 5 Onosho (3-2), quickly slinging him to the ground after the opening collision. Continuing a run of decisive wins, former ozeki Kotoshogiku turned around No. 9 Ikioi (1-4) and forced him out from behind. 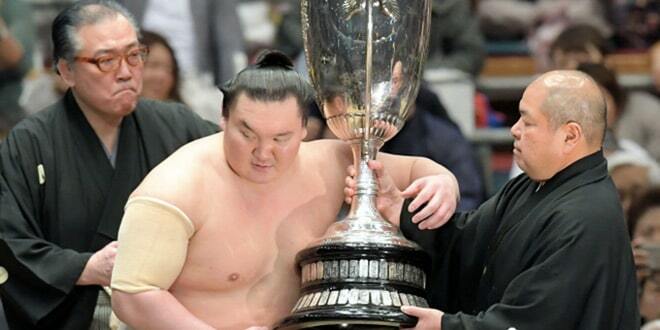 Grand champion Kakuryu improved to 4-1 with an easy slap-down win over No. 2 Daieisho. After the pair inadvertently butted heads at the jump, Daieisho (2-3) surged forward but was sent flying as Kakuryu slipped to the side. 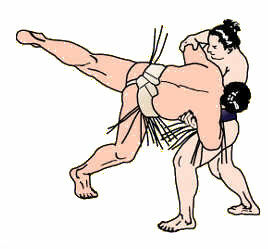 In a battle of the two komusubi, Hokutofuji pushed out Mitakeumi to improve to 2-3. 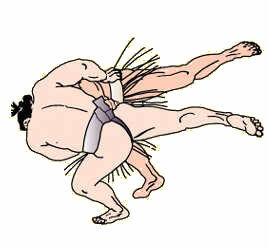 Following a hard impact, the pair jostled for a hold, but it was Hokutofuji who found an opening to drive Mitakeumi (3-2) from the dohyo. Tamawashi, winner of the previous tournament in January, defeated fellow sekiwake Takakeisho, who is seeking promotion to ozeki. Takakeisho (3-2) came in low and hard, driving Tamawashi back, but the Mongolian dug in at the edge of the straw before reversing the momentum. 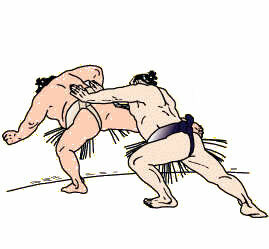 The pair exchanged a series of hard slaps and shoves before Tamawashi (2-3) forced Takakeisho’s back foot outside the straw. 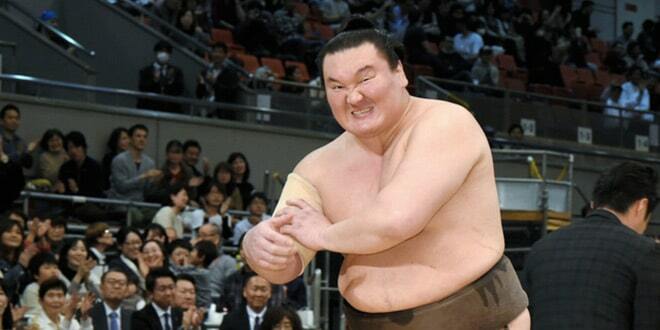 Ozeki Takayasu improved to 4-1 by defeating No. 3 Nishikigi (0-5) with a frontal force out. 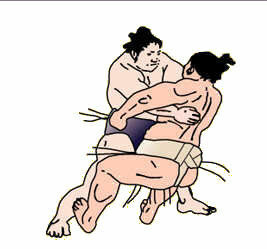 Driving hard with his right shoulder, Takayasu got hold of both of Nishikigi’s arms and quickly bulldozed him out backwards. 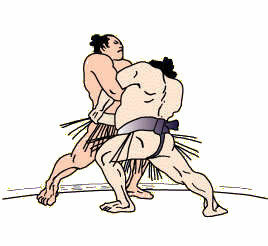 Injury-hampered Georgian ozeki Tochinoshin picked up his third win by outmuscling Brazilian No. 1 maegashira Kaisei (0-5). The two powerfully built wrestlers both gained belt holds after a hard impact, but it was Tochinoshin (3-2), with his right leg heavily bandaged, who used his stronger position to get the win by frontal force out.